Boogarins’ own instincts led them to continue elaborating on the dark themes of 2017’s surprise-drop ​Lá Vem a Morte (Here Comes Death) in a rented house in Texas. The quartet completed several additional tracks before relocating their efforts to a nearby recording studio for multiple sessions with engineer Tim Gerron and producer Gordon Zacharias over the ensuing 2 years, alongside several North American and European tours. For fans of previous works by the band, Fernando Almeida’s songwriting and soaring vocals guide ​Sombrou Dúvida in a way that’s reminiscent of the Latin Grammy-nominated second album “Manual”, which was a portrait of a live band exploring the professional recording studio for the first time. The new 10-song set builds on this premise while retaining many of the home-recordedelectronicelementsofL​ áVemaMorte​. “We didn’t want to write songs telling people ​what to do​, but instead help them ​find their own thing.​ So, there are more questions in the album than answers” Dino adds. In these days of uncertainty, perhaps there’s some comfort to be found by remaining in the shadows. Sombrou Dúvida will be released worldwide on OAR on May 10, 2019. Boogarins’ Fernando “Dino” Almeida and Benke Ferraz began playing music together as teenagers in the central Brazilian city of Goiânia – creating psychedelic pop in their parents’ gardens, filtering their country’s rich musical history through a very modern lens. By the time the group’s home-recorded debut LP, ‘As Plantas Que Curam’ (2013), was released worldwide, the band had recruited a proper rhythm section and were developing a name around Goiânia. Soon after, the group was booking regular gigs in São Paulo and across the country. 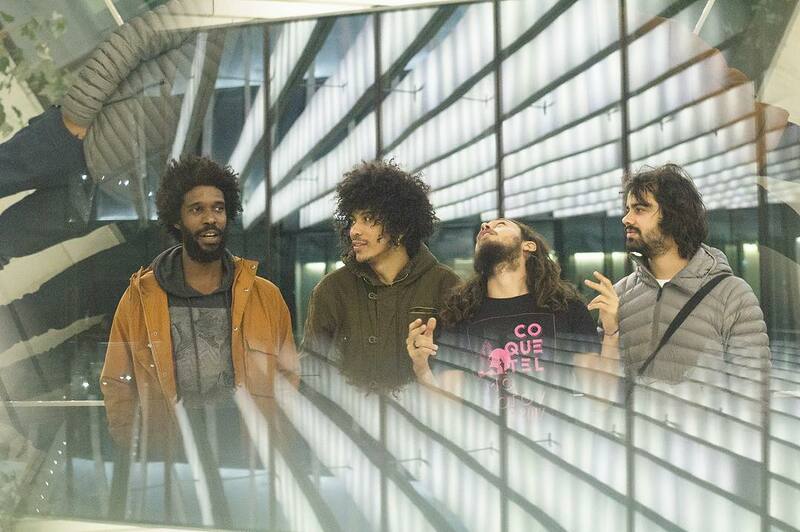 Ultimately, with glowing praise from critics abroad (​Chicago Tribune #9 Album of 2013)​ and a growing international audience, 2014 saw Boogarins circling the globe continually – headlining clubs and playing festivals from Austin to London, Paris to Madrid, New York to San Francisco, Santiago to Mexico City, playing alongside many great artists around the world. The band’s second album, ‘MANUAL’ (2015) — was nominated for a Latin Grammy (Best Rock Album, Portuguese Language) and was launched in London, inspiring ​MOJO Magazine to award the group its MOJO Rising distinction. The Spain-recorded tracks feature a solidified four-piece with bassist Raphael Vaz and drummer Hans Castro. Celebrated Brazilian drummer Ynaiã Benthroldo stepped in for the live duties and the four would eventually hole up in a house next to Austin’s SPACE studios for most of a summer, recording new material in between a several-week Austin club residency, East and West Coast US Tours, and Iberian Peninsula tour, as well as live broadcasts on ​KUTX,​ KEXP​ and N​ PR’s World Cafe​. While continuously touring and recording, highlighted by global festival appearances in ​Central Park,​ Lisbon’s ​Rock in Rio​, São Paulo’s ​Lollapalooza and Vancouver’s ​LEVITATION​, amongst others, 2017 ramped up the group’s recorded output with a snapshot of their increasingly intricate live performances on ‘Desvio Onírico – Live 2016’. The band then continued to dig in further just a few months later with the surprise EP drop ‘Lá Vem a Morte’, a dark and challenging investigation into emotional and sonic incongruity. The acclaimed new material carried the band — once again — across hemispheres, culminating in a breakthrough live appearance in their home country of Brazil at the world’s largest musical festival — ​Rock in Rio​.